We are a leading Manufacturer of beaded scarves, beach scarves, silk scarves and blended silk scarves from Ludhiana, India. With long years of experience in the industry, we are able to offer stunning array of Beaded Scarves. They offer an exciting look and enhance the personality of the wearer. 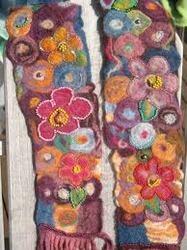 These beaded scarves are draped around the neck makes a fashion statement on its own, owing to its beautiful designs in smooth blending colors. Also, our offered beaded scarves are available with various embellishments, fringes and trim. By keeping track with the latest fashion trends, we are bringing forward an attractive gamut of Beach Scarves. Due to their alluring designs, excellent finish, neat stitching and smooth texture, these scarves have acquired a huge demand in the market segments. The offered beach scarves are designed by our experts using top quality fabric & advance machines keeping in mind the trends of market. 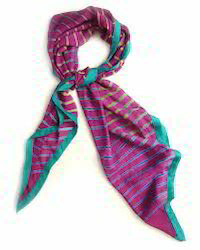 We offer these beach scarves in varied sizes at market price in a committed time frame. Our enterprise specializes in offering a distinct collection Silk Scarves. Our silk scarves enhance the personality of the wearer and are widely known for their trendy look and smooth texture. 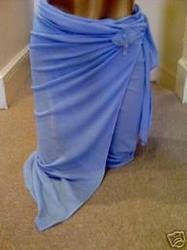 As well, these silk scarves are available on numerous colors & sizes as per the needs of customers. Our valuable customers can purchase these silk scarves from us at reasonable price in a stipulated time frame. Running with an objective to accomplish diversified demands of the client, we are manufacturing, exporting and supplying a wide array of Blended Silk Scarves. These silk scarves are designed using outstanding quality fabric & updated machinery in adherence to latest market trends. Our silk scarves are perfect to enhance the beauty of the wearer. 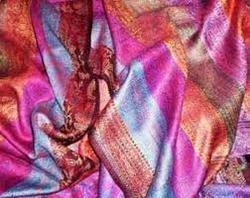 The offered silk scarves are provided in varied designs, sizes and color options so as to meet the demand of customers.